If ever there was a franchise built on a heaping, Olympus-high mountain of wasted potential, it’s Warner Bros.’s Titans series. 2009’s Clash of the Titans, a remake of Desmond Davis’s 1981 cult hit, stuffed a monumental cast of thunderous mythological heavy-hitters into a stolid, directionless hack ‘n slash bore-a-thon that struck with all the sound and fury of a wiffle ball bat. Cluelessly bungling a sure-fire recipe for cheesy popcorn nirvana, the film was little more than a showcase for wonderfully-designed, choppily-executed CG monsters and the perpetually apathetic smirk of buff, charisma-challenged lead Sam Worthington. Yet, the picture’s gloriously silly “Release the Kraken!” marketing push worked wonders – generating a gigantic $500-million in worldwide ticket sales – and has inspired a return trip to creature-infested ancient Greece in Wrath of the Titans, an oh-so-slightly superior follow-up that’s equal parts sequel and remake of its uninspired forebear. Following the same template as Clash, this second attempt is still a story-telling dead end, though it at least pares down the convoluted nonsense to a manageable length and delivers an appropriate amount of stylish, empty-headed effects overkill. The result is often like watching a friend play an impressive-looking video-game; you can admire the spectacle even if the experience is forgettable. 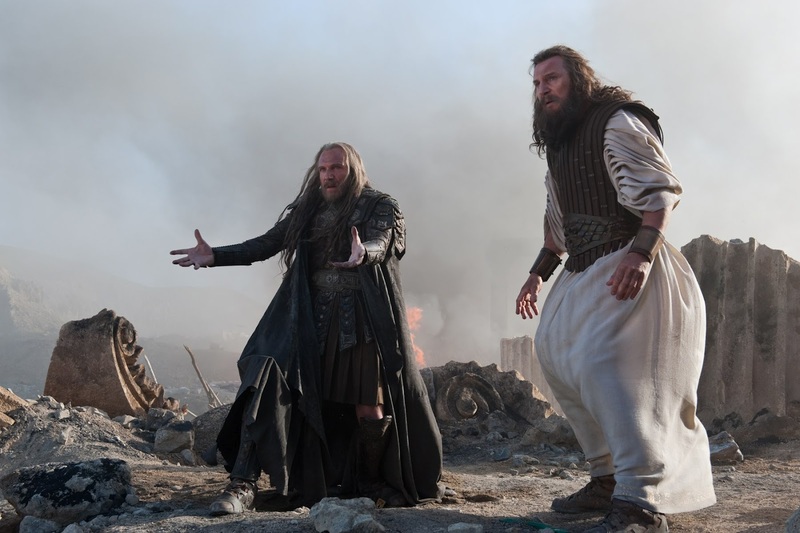 Taking place roughly a decade after the events of Clash, Wrath finds Worthington’s stoic demigod Perseus living the serenely sleepy life of a fisherman and single father to his adolescent son Helius (John Bell), indifferent to his divine heritage and the wants of his almighty father Zeus (Liam Neeson – sporting his silly beard with unwavering authority). 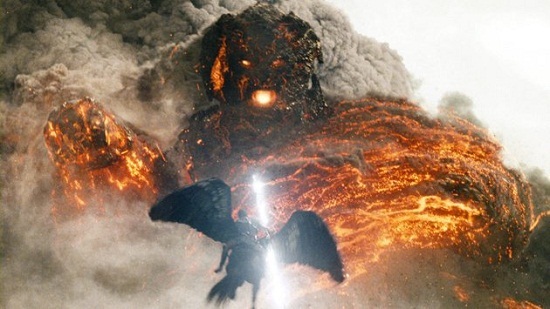 Things take a turn for the earth-rumbling, however, when the lightning bolt-wielding deity is taken prisoner by his embittered brother Hades (Ralph Fiennes) and son Ares (Edgar Ramirez), and used as a means of releasing Kronos, the destructive, volcano-sized father of the Gods, from his crumbling subterranean prison. With the evil being’s grotesque titan army already loose and wreaking havoc, Perseus is forced to team up with Poseidon’s no-good son Agenor (Toby Kebbell – serving no genuine purpose beyond terrible jokes) and the warrior queen Andromeda (Rosamund Pike) and embark on a quest to once more restore peace to the fractured land. How mankind’s oldest, richest stories could inspire a script this vacant is a mystery best left to the ages. While there’s nothing wrong with using classical literature to craft light-hearted swashbuckling fun (1963’s stellar Jason and the Argonauts pulled off this feat in spades),Wrath is so uninterested in its flimsy narrative it’s off-putting. The script, by a crew of four credited writers, sends its characters on an epic journey that feels like it spans all of a weekend. Although the film’s title screams larger than life thrills, there’s no grandeur to the picture, with its blank, paper-thin heroes and villains and abominable dialogue, or any sense that we’re being swept up in a breathless tale. It’s hard to ignore the nagging aura of déjà vu that lingers over the film. Just as in its predecessor, Perseus must transition from a fisherman to fighter and learn to accept his demigod status. And, again, his arc occurs over the course of a location-hopping search, fraught with fearsome beasts, death-defying traps and feeble romantic interludes, that ends with him swooping around on his trusty steed Pegasus in confusing combat against a final behemoth boss. For a dependable and predictable B-movie formula of this type to really work there has to be a twinkle of joy and go-for-broke imagination at play, like in the Indiana Jones or James Bond movies. 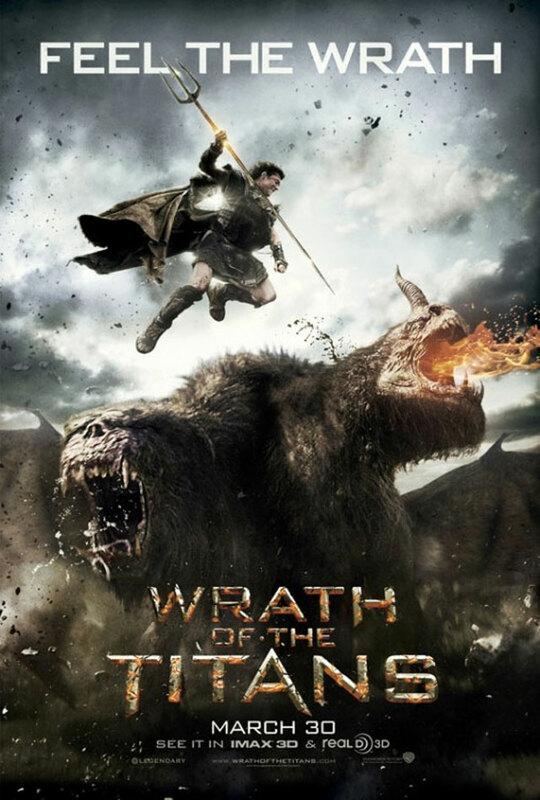 Wrath of the Titans, unfortunately, operates under the crushing weight of dutifulness; to keeping the fledgling brand name alive and earning. It isn’t an entertainment, so much as a canny business decision. Taking over the directorial reigns from Louis Leterrier, series newcomer Jonathan Liebesman doesn’t have a resume worth writing home about – his unremarkable past efforts include Battle: Los Angeles and Texas Chainsaw Massacre: The Beginning – nevertheless he’s a competent journeyman with enough visual flare to skate by more or less unscathed. Unconcerned with his dopey plot, the helmer instead sweats over the money shots; enlivening a few nicely assembled sequences including a suspenseful forest-set tussle with a trio of babbling Cyclops (whose alarming appearance is counterbalanced by a noticeable glint of quirky Ray Harryhausen-esque oddness) and a village-wrecking encounter with a ravenous, and seemingly female genitalia-tailed(!) Chimera. Liebesman also does his darndest to give Kronos’s explosive entrance scope and weight, in spite of the fact there’s something patently phony about watching human actors stand in the foreground shooting energy projectiles at an enormous stationary creation in the background (Shades of the climax of the goofy 1983 fantasy fave Krull). 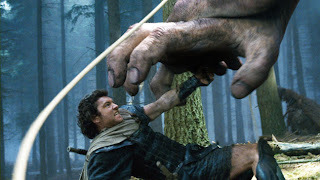 Unfortunately, he doesn’t bring the same level of attention to the picture’s bewildering labyrinth set-piece, where coherent cinematic geography vanishes into thin air, and a truly underwhelming close-quarters WWE-style Minotaur wrestling match. No one expects to see great performances in these types of movies. That’s pretty much a given. Still, they can afford gifted actors a platform to revel in the glory of pure camp. In the original Clash, for example, Laurence Olivier consumed scenery by the heaping spoonful as Zeus and Burgess Meredith was a tongue-in-cheek hoot as a mischievous mentor/exposition machine. Wrath of the Titans, by contrast, offers up the invaluable Bill Nighy, as a loony navigator with a make-believe friend, as its sole weirdo stand out. Worthington – now fully reverted back to his native Australian dialect – is a physically skilled non-entity, while Neeson and Fiennes, who squabble with admirable gravitas, keep their moments of broad theatrical invention to a regrettable minimum. This picture is the epitome of the one-week blockbuster; produced solely to dominate a single box-office chart before vanishing entirely from the audience’s collective memory. It’s a shame, as this is a franchise that should provide visionary filmmakers with a veritable playground of magical story possibilities, sweeping otherworldly locales and broad, iconic characters capable of leaving an indelible stamp on an audience. 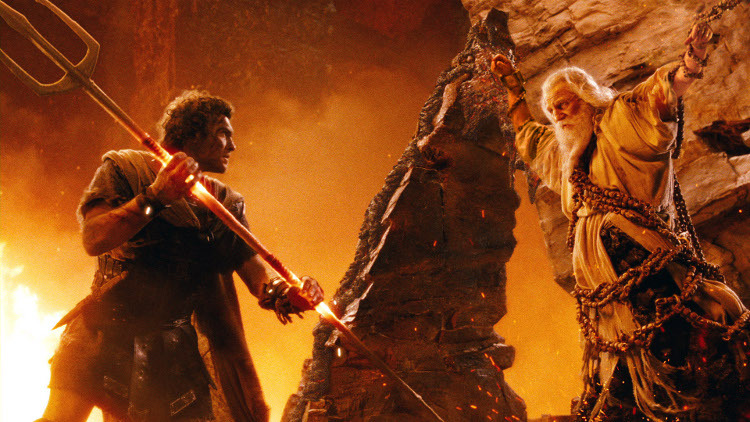 Those behind Wrath of the Titans may have read up on their Greek mythology, but it’s glaringly evident there weren’t any Muses visiting the set.